"This is an old Italian recipe for a pie with a sweet crust--just like from the old country. My in-laws are Italian and they say that this is the best pie. It is always requested for Christmas. Mini chocolate bits and lemon rind can be mixed into the batter." Beat the 12 eggs, 2 cups sugar and vanilla extract together in a large bowl. Stir in the ricotta cheese and the chocolate chips, if using (see Cook's Note). Set aside. Combine the flour, baking powder, and 1 cup sugar together. Cut in 1/2 cup plus 1 tablespoon shortening until the mixture resembles coarse crumbs. Mix in 4 beaten eggs and 1 teaspoon vanilla extract. Divide dough into 4 balls, wrap in plastic, and chill for at least 30 minutes. Preheat oven to 325 degrees F (165 degrees C). Grease two deep-dish pie plates. Pour the ricotta filling evenly into the pie crusts. Top each pie with 8 narrow strips of dough or cookie cut-outs. Brush top of pie with milk for shine, if desired. Place foil on the edge of crust. Bake in preheated oven for 20 to 30 minutes; remove foil. Rotate pies on the rack so they will bake evenly. Continue to bake until a knife inserted in the center of each pie comes out clean, 25 to 30 minutes more. Cool completely on wire racks. Refrigerate until serving. 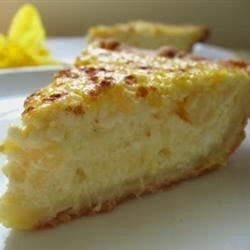 A favorite Italian cheese pie. Instead of the chocolate chips, you can use 1 tablespoon fresh lemon zest. This recipe requires 16 eggs, 12 of which are in the filling....unfortunately, it tastes very "eggy" and was unappealing. Otherwise, the pies look good and are somewhat tasty. Absolutely delicious. Probably the best pie I've ever had. I did cheat and use premade crust. Next I plan to try it with a little crushed pineapple. I've tried to make different versions of this pie and this one was far and above the best. Its the first time my family really raved about this pie. This is a beautiful recipe, I have replaced my recipe, for this one. I have made it for Easter for the past 2 years. Great ! !